This wonderful luxury villa for sale is in a panoramic position overlooking the rocks on the Amalfi Coast. This historical estate dates back to the 18th century and has been restored by its current owners, who maintained its original features. The main floor is home to a bright living room with big windows and to a special suite of the Montgolfier brothers. This level also features a panoramic terrace running around the whole villa, an excellent point to enjoy the view of the surroundings. A charming staircase then leads us to the sleeping area, composed of four bedrooms with a view of the sea and some balconies overlooking the terrace. The suites feature frescoed domes with original paintings, charming marble fireplaces, doors painted by artists of the School of Naples, and cotto-tiled floors with ceramic decorations. On the lower floor there is the “Romeo and Juliet” suite, equipped with independent access and a balcony offering a charming atmosphere overlooking the sea and the elegant “Afroditis” swimming pool, itself equipped with a sunbathing area, showers, a bar, and changing rooms. The whole estate is surrounded by 1,200 m2 of grounds featuring a luxuriant garden and this region's typical olive trees. 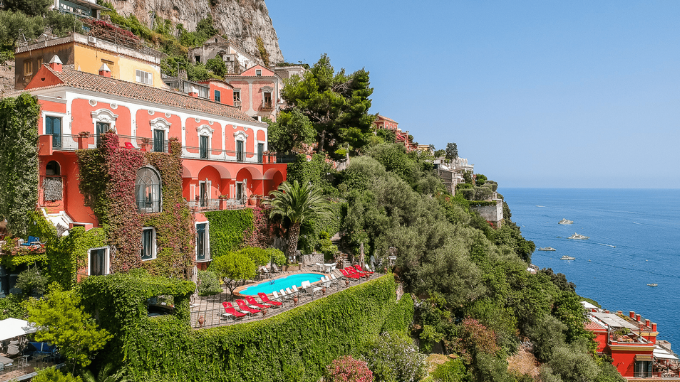 Besides its priceless setting, this exclusive villa also features a breathtaking 360-degree view offering fairy-tale landscapes which, on very clear days, even include the outline of the Island of Capri. This property for sale is in Capri, it drops sheer down to the crystal-blue sea and is a short distance from the famous Blue grotto.